Extremely rare vintage Satyajit Ray movie poster of one of the finest films ever made in Bengali cinema, Nayak (1966) for sale. Written and directed by master filmmaker Satyajit Ray, Nayak is a Bengali drama that starred Uttam Kumar and Sharmila Tagore in lead roles. This Satyajit Ray masterpiece won the National Film Award for Best Feature Film in Bengali in 1967, making this Nayak movie poster highly collectible! Printed and circulated during the debut release of the film (somewhere in the mid 1960s), this is one of the rarest Satyajit Ray film posters for sale that one can buy. The story of Nayak revolves around a successful film actor who is traveling on an overnight train to receive a national award. During the journey, he ends up revealing his failures, insecurities and regrets to a young journalist who realizes that hidden behind all the glamor and stardom is a broken man. Nayak won a Golden Bear nomination for Best Film at the Berlin International Film Festival in 1966. Before venturing into film making, Satyajit Ray worked as a commercial artist. It is widely believed that he designed the original posters of quite a few of his films himself, including the beautiful poster featured here for sale. Extremely rare original Satyajit Ray movie poster for sale of one of the greatest films ever made in world cinema, Apur Sansar (1959). This is an actual surviving publicity poster of the Satyajit Ray masterpiece regarded as one of the greatest films ever made in world cinema. 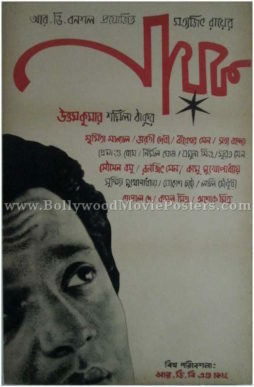 Apur Sansar is a Bengali drama film directed by legendary filmmaker Satyajit Ray. It is the third and final installment in the “Apu Trilogy” after Pather Panchali (1955) and Aparajito (1956). The series revolves around the life of a young Bengali girl named Apu. 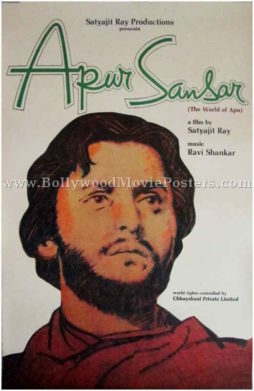 Apur Sansar won the National Film Award and several international awards, finding mention among the greatest films of all time, making this poster, highly collectible! Printed and circulated during the first release of the film (somewhere in the early 1960s), this is one of the rarest Satyajit Ray film posters for sale that one can buy. Besides numerous other accolades, The Apu Trilogy was included in Time magazine’s All-Time 100 best movies list. Extremely rare original vintage Satyajit Ray movie poster of one of the greatest films ever made, Pather Panchali (1955) for sale. This is an actual surviving publicity poster of Satyajit Ray’s stellar directorial debut, unanimously regarded as his finest film. Pather Panchali is a Bengali film directed by Satyajit Ray and produced by the Government of West Bengal, India. The cult film is based on Bibhutibhushan Bandopadhyay’s 1929 Bengali novel of the same name and depicts the harsh childhood of the protagonist Apu. Following its premiere in mid 1955 at New York’s Museum of Modern Art, Pather Panchali was later released in Calcutta the same year. Printed and circulated during the Calcutta release of the film (somewhere in the mid 1950s), this is one of the rarest Satyajit Ray film posters for sale that one can buy. Pather Panchali has made an indelible mark on the history of cinema with its soul-stirring realism. Such was the film’s appeal that a special screening was attended by the Chief Minister of West Bengal and the Prime Minister of India. Pather Panchali is the first installment of Satyajit Ray’s Apu trilogy. Lead protagonist Apu’s life was continued in two subsequent film’s made by Ray, namely Aparajito (1956) and Apur Sansar (1959). Pather Panchali is considered one of the biggest landmarks (a turning point) in Indian cinema to the extent that critics labeled the film as “pure cinema” and refused to compare it against any other film. The film pioneered the parallel cinema movement in India and was one of the earliest films to generate major international attention, placing India on the world cinema map. The film won several national as well as international awards, most notable being National Film Award for Best Feature Film in 1955 and the Best Human Document award at the 1956 Cannes Film Festival. Pather Panchali established Satyajit Ray as one of India’s finest filmmakers. The film is featured in several lists of the greatest films ever made, making this poster extremely collectible! Before venturing into film making, Satyajit Ray worked as a graphic designer. It is widely believed that he designed the original posters of quite a few of his films himself, including the beautiful hand painted original Pather Panchali 1955 poster featured here for sale.